34/196 Max Braden A lot of this story bears a close resemblance to Tombstone. My major problem with it is the villain's inexplicable abandonment of his character midway through. Randall Bragg, played by Jeremy Irons, is a wealthy rancher who has taken control over a small, non-descript town called Appaloosa in an unidentified part of the American west. He rules the town after killing its marshal and his deputy and simply takes whatever he pleases, be it property or even worse, people. The small town quietly contacts two former gunmen and offers them the recently vacated position of marshal and deputy. Virgil Cole, played by Ed Harris, is the new marshal and Everett Hitch, played by Viggo Mortensen, is his deputy. Both men understand the lure of easy wealth through evil deeds and yet they both have made conscious choices to be on the good and proper side of the law. The two sides are now bound to collide and battle for ultimate control over the town. In this way, this story (if not the setting) is not unfamiliar to modern audiences. The latest and perhaps one of the best recent examples of this type of story is actually Batman Begins. 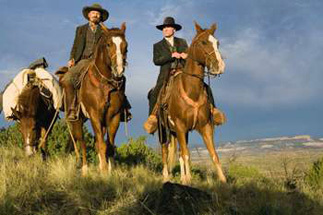 In it, Bruce Wayne is similar to the two almost but not quite anti-heroes of Appaloosa. They use their understanding of the damaged moral make-up of their opponents to their advantage. They have this knowledge perhaps because, save for their choice and a traumatic event or two, they too could indulge in their opponent’s lifestyle. Rene Zellweger presumably will play the young widow, Miss French, apparently a woman with her own questionable moral code who complicates Virgil Cole’s already complex ethical terrain. Ed Harris not only stars in the film but also helped write the screenplay, produces and directs. It will be his second time assuming the position of director since his directorial debut in 2000’s Pollack. His first challenge was actually to begin filming in October of 2007, as fears of a looming actor’s strike threatened to halt productions across Hollywood. They proved to be at the time of this writing unwarranted fears but production was advanced.